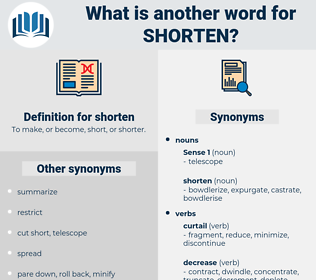 What is another word for shorten? To make, or become, short, or shorter. reduced, reducing, curtail, abridge, downsize, lessen, diminish, compress, decrease, minimize, expedite, streamline, hasten, restrict, cut, mitigate, alleviate, lighten, limit, soften, save, improve, bridge, slash, relieve, curb, ease, confine. 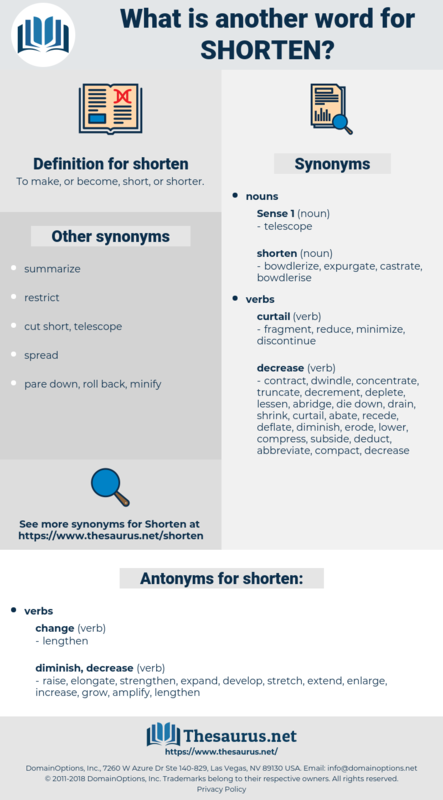 abbreviate, shrink, narrow, accelerate, minimise, lower. enlarge, extend, stretch, raise, develop, expand, increase, elongate, grow, strengthen, amplify. boost, maximize, balloon, blow up, inflate, swell, supplement, heighten, distend. The sincere repentance which he showed induced the inquisitor - general, Quiroga, to shorten the duration of his penance; I must add that the purity of Ripalda's faith and morals after this event were such as to render him worthy of the esteem and respect of mankind. Follow my advice: go to Italy, and do not shorten your life by the sorrows which may await you in England. secretion, Sir Yehudi Menuhin, sardine, sheridan, sheraton, serotine, secretin, sourdine, sardinia, scrutiny, shire town, sardina, sortition, short ton, shower down, serotonin, sardinian, susurration, scrotum, sordino, serration. cut, cut short, syncopate, foreshorten, curtail, truncate, clip. cut back, cut down, fall, bring down, cut, alter, decrease, lessen, trim, diminish, modify, change, trim back, trim down, reduce.